Unbending US Hostility Toward Russia. 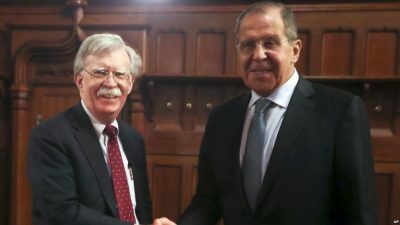 Bolton Meets Putin in Moscow. Will Trump and Putin Meet in Paris in November? John Bolton’s two-day trip, meeting Putin, Sergey Lavrov, and other top Russian officials, did nothing to soften US hostility toward the country. Bilateral relations continue deteriorating, not improving. Nothing in prospect suggests positive change. On Tuesday, Putin and Bolton met for 90 minutes, agreeing that dialogue between both sides is needed, despite irreconcilable differences on major issues. It includes multiple rounds of illegal US sanctions, numerous false accusations against Russia, proof absent every time because none exists, both countries on opposite sides of the Syrian conflict, and the latest shoe to drop with Trump’s announced landmark INF Treaty pullout – falsely claiming Russian breaches, ignoring clear US ones. Claiming both sides suggested ways to improve relations ignored Washington’s unbending hostility toward Russia. According to the Wall Street Journal, Bolton intends speaking with US NATO and Asian allies about Trump’s announced INF Treaty pullout, DLT saying the US will build up its nuclear arsenal. The “game” is unilaterally initiated by Washington, forcing other nations to respond in self-defense. Will a hugely dangerous arms race will follow his INF pullout, creating greater international insecurity and instability than already? Wanting to militarize more than already and further advance its belligerent imperial agenda is what pulling out of the JCPOA and INF Treaty is all about. Greater US aggression is likely coming instead of stepping back from the brink, Iran a likely target, maybe Venezuela for control over its world’s largest oil reserves, and North Korea if denuclearization talks fail.